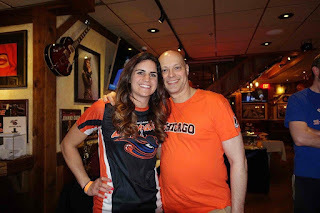 Last Monday, my coverage of the 2019 Chicago Bandits officially kicked off with the National Pro Fastpitch Draft. 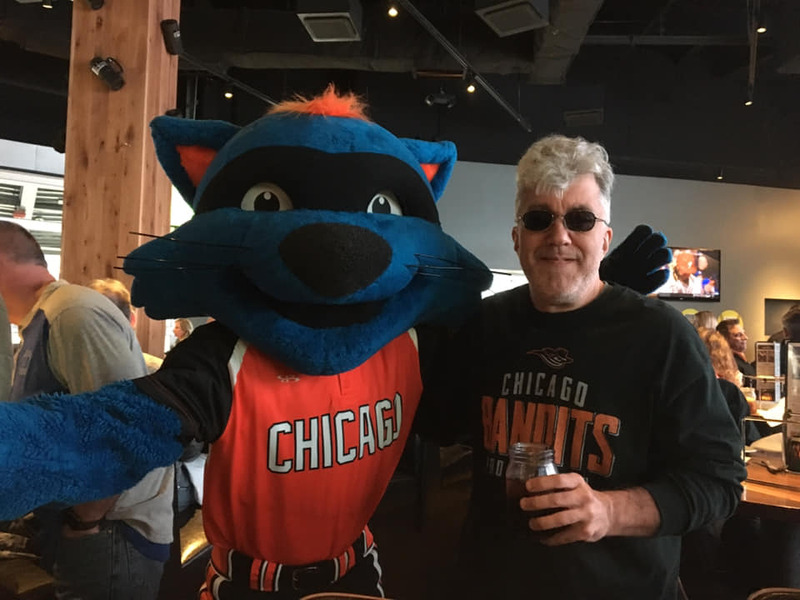 The Bandits hosted the event at King's Dining and Entertainment in Rosemont. Kings was packed with Bandits fans as we watched the draft unfold on big screens. Current players Courtney Gano and Abby Ramirez were joined by Bandits legend Amber Patton and several members of the front office and everyone's favorite mascot Swiper. The Bandits contingent mingled and chatted with fans all night. This group of collegiate stars will only make the Bandits younger and stronger. 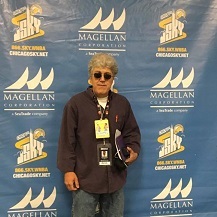 I also covered the night for Patch.com at Chicago Bandits 2019 National Pro Fastpitch Draft. My coverage will appear there, online at Global Traveler and also right here all season. Check any and all of those places all season. Also go to ChicagoBandits.com for more news, scheduling and other info. Swiper and me in Rosemont, IL-April 2019. Friend Encounters is a weekly series featuring friends who have met celebrities. 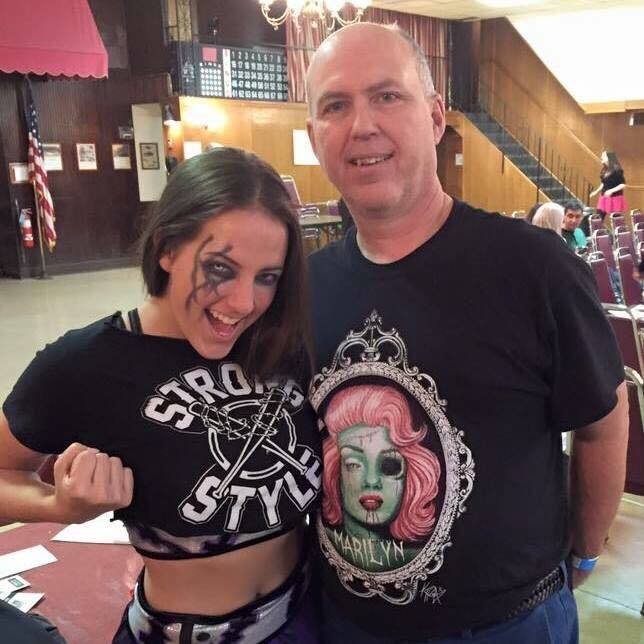 When the picture below was taken, the wrestler was known as Crazy Mary Dobson. She was the women's champ at Resistance Pro Wrestling. Although she was pretty young, you knew she was destined for great things in wrestling. Those great things would start coming quickly, s she soon joined the WWE, where she is currently wrestling as Sarah Logan. Whether Mary or Sarah, she is a real talented performer. I expect her to continue to improve and one day become WWE women''s champ. The man in the photo was known as Jim Strong. Actually, he is still Jim Strong. He really has no fascinating back story, but I had to include him because he's in the picture with Sarah. Seriously, Jim is a good friend and a big fan of wrestling. I just like giving him a hard time. Along with being a fan, he is a big supporter of the performers, meaning he buys their tshirts (fortunately he doesn't wear them like Sarah), pictures and more. Jim has met so many wrestlers, but Sarah has to be among the best. If she is not yet, it really is only a matter of time. 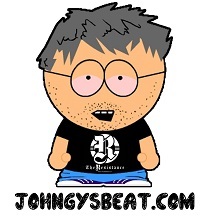 While Sarah is on her way to greatness, Jim is cruising along in mediocrity.Occasionally he rises above, lke now, when he is the co-feature on JohngysBeat.com. This is a regular series in which I create virtual trading cards for celebrities wearing jerseys. Once again, we are working our way alphabetically through all of the Major League Baseball teams. Although he was billed as hailing from Glasgow, Scotland, Roddy Piper was actually born in Canada. He overcame a rough upbringing to forge a Hall of Fame career in wrestling. Unfortunately, Roddy died in 2017, far too early. He was my favorite wrestler and he was a friend. He joined fellow wrestling legends Bobby "The Brain" Heenan and "Mean" Gene Okerlund for a special day in Toronto. 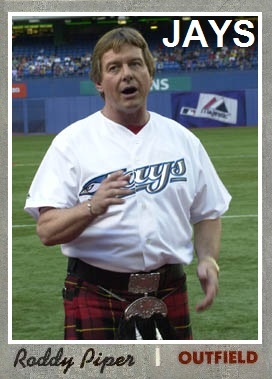 This is the first Celebrity Jersey Card featuring a kilt. RIP RRP. Born in South Dakota, Gene Okerlund started his legendary wrestling announcing career in Minnesota with the now defunct AWA. Along the way to his Hall of Fame career, "Mean" Gene interviewed all of the big names while working for all of the big companies. Gene's son Todd played for the US Olympic hockey team and briefly for the New York Islanders. Gene died earlier this year, only a couple months after I last saw him. 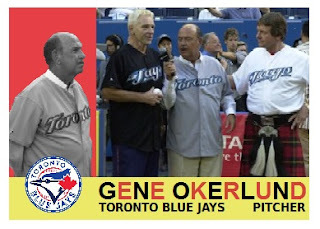 Gene's Celebrity Jersey Card comes from a special day with the Blue Jays, which also featured "Bobby The Brain" Heenan and "Rowdy" Roddy Piper. Today I celebrate the second of my sisters' birthdays this month. Her age isn;t important, but she is a grandmother...and an awesome grandmother, too! Like our older sister Nancy, Jean is a rock for me. She has helped me in so many ways, I can't even count. More importantly, she is always there to support me. She never fails to make me laugh or to feel better about anything. I couldn't have made it this far without my sisters. Jean is a great sister and now as I previously mentioned, she is a fantastic grandmother! Little Delaney is lucky to have grandma Jean, just as I am lucky to have sister Jean. Jean has let me barge in on many family trips. We have been to really cool places and fun events, but some of the most memorable times were just us hanging around the house. Happy birthday Jean. I love and appreciate you! 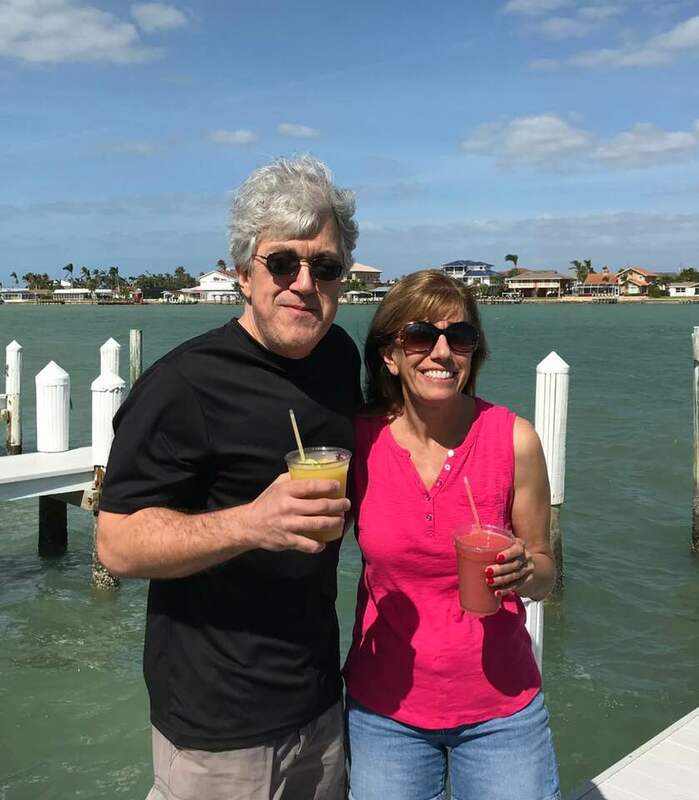 Jean Parker and me in Marco Island, FL-January 2018. 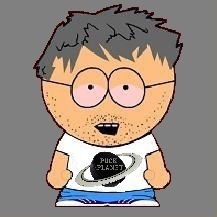 My name is John and I am a "Halien." 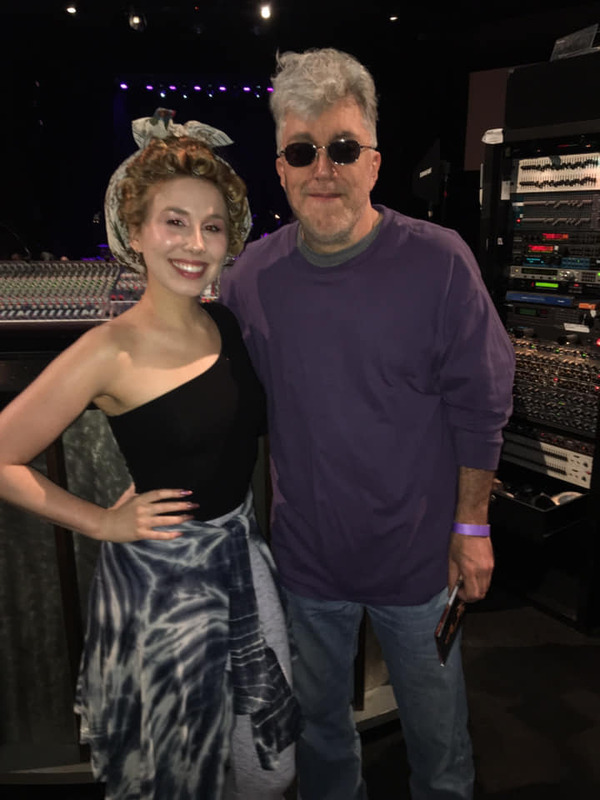 Last Sunday, I had the pleasure of attending the Haley Reinhart concert. It was my third time seeing Haley and I thoroughly enjoyed each show. My report for Global Traveler appears online at Haley Reinhart at Chicago's Park West. My friends know I am not a concert guy. I see Billy Joel every time he comes to Chicago, but that is pretty much it. I probably have seen less than 15 concerts (not counting Billy) in my life. From the first time I heard Haley singing "Creep" on YouTube, I was hooked. Haley is one of the few musical acts of the last 25 years or so that I really like. I prefer more classic rock, although in many ways, Haley is a throwback. Her previous cd What's That Sound? is a perfect example of how she embraces that era. There has been a soundcheck and a meet-and-greet at each of the three shows. Haley actually remembered me from the show last year. The Park West holds about 1,000 people and I swear about 25% of the crowd was part of her family. Even those of us who aren't related were treated like extended family. Maybe because it is Chicago, but her shows are always like a big reunion. An especially heart-warming moment was when she called her grandfather to the stage and gave him a huge hug during soundcheck. Haley's father Harry joined her on stage for a couple songs. A musician in his own right, the elder Reinhart had an amazing guitar solo. Haley is a Chicago-area gal, but my appreciation goes way beyond her roots. I love her vocal range (from sultry slow songs to raucous rockers). In addition to that, she is a real sweetheart. You can go to HaleyReinhart.com for more info on her. You can also check here, because I will be sure to write about any major Haley news. I admit it. I am a "Halien." Haley Reinhart and me in Chicago, IL-April 2019. 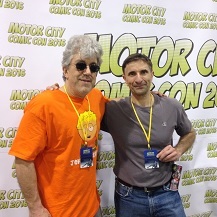 Motor City Comic Con is coming to Novi, MI May 17-19. While I look forward to three days of fun, I am looking back at some of my favorite times over my many years at MCCC. Artist Sara Richard is one of my favorite people I have met at any convention. Immensely talented, funny and fascinating, Sara is simply the best. Her creations are so light and flowing. I literally get lost in them every time I see them at cons or online. I have written many times about Sara's version of the Johngy character which hangs in my home and also her book (with Franco) The Ghost, The Owl. I recently discovered another piece she did. How I missed it previously is a mystery to me. 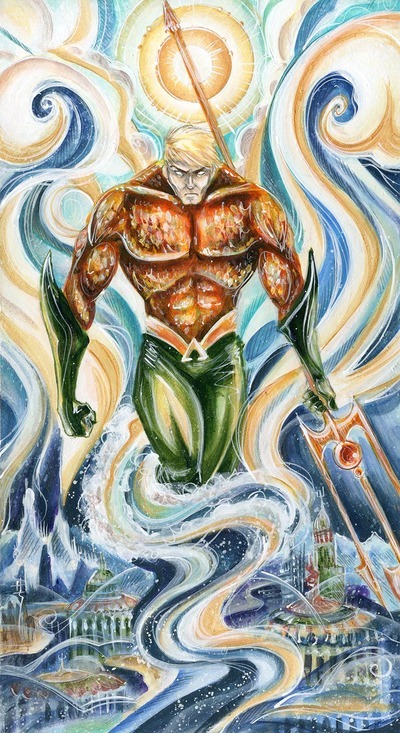 Aquaman is always the first thing I seek at any artist's booth. 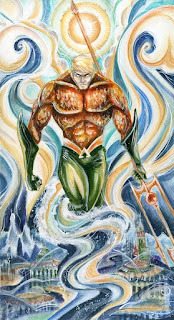 Sara even did the old school Aquaman! Once again Sara has raised my level of appreciation for her. 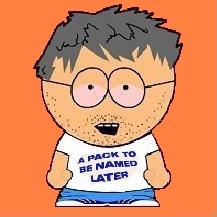 If I sound like a fanboy, I make no apologies. There is a reason why is is one of the most popular creator guests at any convention and why she has worked with some of the biggest companies. She has such passion for her work and for life in general. If you get a chance to talk to her, ask her about dinosaurs, tombstone-cleaning, snapping turtles and drawing owls. Just don't mention centipedes, as she claims to be terrified of them. Sara has already been announced as an artist guest at this year's MCCC and I look forward to seeing her and catching up with her. I have interviewed Sara several times and she always has something new to say. Of course, I will be getting an update interview, talking about her book and other new projects. You can get more info on Sara and her beautiful work at SaraRichard.com. Be sure to go to MotorCityComicCon.com for all of the info and scheduling. Sara Richard and me in Novi, MI-May 2017. Motor City Comic Con is about a month away. On May 17-19, I'll be in Novi, MI ensconced in pop culture greatness. Until then, I am recalling some of my favorite bits from my many years of covering the MCCC. Primo Cardinalli didn't call himself a professional artist until his mid-40's. His path to becoming an artist is a fascinating tale of talent and perseverance. He has overcome struggles, including literally being a starving artist. Fortunately, Primo stuck with his skills and is still producing awesome artwork. 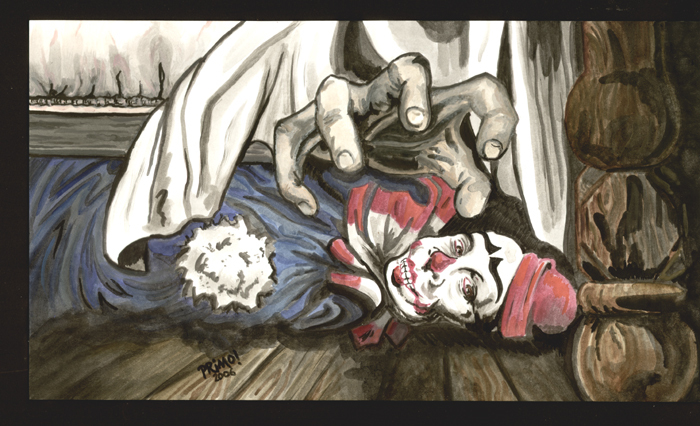 A self-described "monster kid" growing up, Primo explains that he mostly paints "monsters and dead things from movies." One of my favorite pieces is titled, "What's Under Your Bed?" With a colorful past, a similarly colorful look and beautiful creations, Primo stands out in Artist Alley. Primo's booth is a yearly stop for me at Motor City Comic Con. I always look forward to catching up with him and seeing his new pieces. Follow Primo Cardinalli on Facebook to get frequent updates and images of his creations. You can also follow Primo Cardinalli on Patreon. Go to MotorCityComicCon.com to get all of the info on this year's event, including the celebrity guest list and schedule. Primo Cardinalli and me in Novi, MI-May 2017. In a few weeks, I will heading to the Motor City Comic Con. This year, the MCCCC is being held on Friday, May 18 through Sunday, May 20. As usual, it will be at the Suburban Collection Showplace. I have been going to the MCCC for many years and I have so many great memories and pictures. It was one of the first cons I ever attended and it remains a yearly stop on my con schedule. Leading up to MCCC, I will be recalling some of my favorite moments from all of my years at MCCC. Novi is an easy 5ish hour drive for me. Unfortunately, I will not be driving the cool MCCC van you see below. While I am sure that would be a fun ride, they are not offering that to fans or the press. 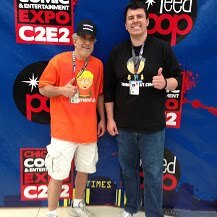 Whenever I write about the MCCC, I always feel compelled to mention how the folks in charge have really done a great job of improving the logistics and experience as the convention really started to grow. They have a lot of staffers on hand everywhere to minimize problems and to ensure everything runs as smoothly as possible. 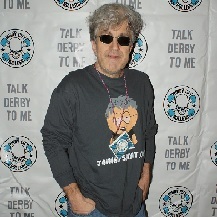 Check MotorCityComicCon.com for all of the info and stay tuned here for a sampling of the great celebrities, artists and more I have met at MCCC. It's always full of talented folks from all over the pop culture universe! The official vehicle of MCCC 207 and me in Novi, MI-May 2017. Today, I feature two great people I have met through the Chicago Bandits. One is a former player and the other is a diehard fan. Emily Allard was a star outfielder at Northwestern. She joined the Bandits in 2014, my first full season of covering the team. Unfortunately, Emily suffered a concussion in 2016, which ultimately ended her playing career. Tough, courageous and intelligent, Emily did not let the setback stop her. Emily and her former Northwestern teammate Kristin Scharkey started Be The Momentum. They offer various forms of instruction on the fine art of slapping. You don't have to be a slugger to be a game-changer. I was always impressed with Emily on the field, but I am probably more impressed with her now. She is such a fine young woman and she is an even bigger and better role model now than when she played. She was the ideal person for a HeroTV episode. That interview can be found at HeroTV2017 Emily Allard on YouTube. Chris Bejcek is a role model, too. He is a great example of a perfect fan. He supports the team win or lose. He jokes with the players and other fans. He is one of my best sources for Bandits or National Pro Fastpitch info. Not a one trick pony though, Chris is a noted music fan. I believe he once posted that he has been to more than 1000 concerts. As large of a number as that is, I totall believe it. Follow him on social media and see all of the musical greats he has seen. It is even more impressive than his NPF roll call. College softball is in full swing right now and the Bandits season is right around the corner. I can't wait to be back in Rosemont. Of course, I'll see Chris many times during the season. If we are lucky, we might even get an appearance by good old #24. Check out BeTheMomentumSoftball.com for more info on empowering slappers. Also, go to ChicagoBandits.com for info on the team, including their schedule. Emily Allard and Chris Bejcek in Rosemont, IL-April 2016. Geoff Blum is a former Major League Baseball player who had a solid 14 year career. Originally drafted by the Montreal Expos,. Blum made his debut in 1999 and played 3 seasons north of the border. He was traded to the Houston Astros, where he played 2 seasons, before being traded to the Tampa Bay Rays, where he played in 2004. The San Diego Padres signed him for the 2005 season, but traded him to my Chicago White Sox during the season. As a long-time fan of Blum's, it was cool to see him play here. He only appeared in 31 games for the Sox during the regular season, but it was his big home run in the World Series which forever earned him a place in the hearts of Sox fans. He hit a game-winning solo home run in the 14th inning in Game 3 of the 2005 World Series. After the season, he returned to San Diego as a free agent. He played 2 seasons in San Diego, returned to Houston for 3 more seasons and finished with 2 seasons with the Arizona Diamondbacks. The versatile Blum logged time at all infield positions, as well as the outfield. For his career, he hit .250, with 990 hits, 99 home runs, 479 rbi's and 446 runs scored. I had the pleasure of getting a quick interview with Blum during his time with the Astros. That interview can be found at On the Beat with Geoff Blum. It was very cool to talk to one of my long-time favorites and a White Sox hero. Recently, Blum was kind enough to do a promo video for me. That video is below. Thanks to Geoff for the promo video and for years of fun following your career. Go to Blummer27.com for more info on Blum. You can also follow him at @Blummer27 on twitter. You can also get a video from Geoff at Cameo.